Feet, bras, autopsies, hair. 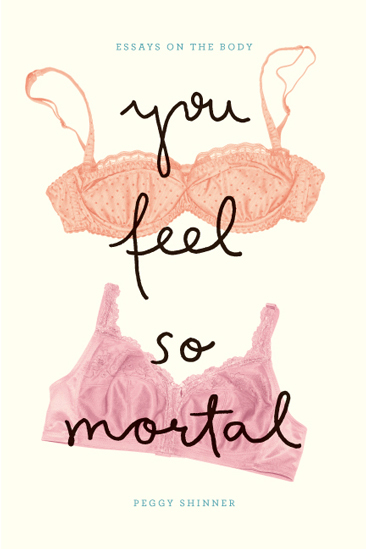 You Feel So Mortal is a collection of essays about the body. It looks at the author’s own body, female and Jewish; her parents, the bodies she came from; the collective body, with all the social and political forces it brings to bear. “Family Feet” examines feet through the often-skewed lens of history, and discovers that the author’s flat-footed specimens are, according to some, decidedly and disturbingly Jewish. “The Fitting(s)” considers bras, breasts, and the storied bra fitter. “Postmortem,” an essay about autopsies, asks, from a grieving daughter’s point of view, what it means to cut the body open. “Berenice’s Hair,” a time-trip through myth, culture, and history, looks at women’s hair in ancient Rome, France, Laos, Syria, Cuba, India, and the author’s own past as well. Over the course of twelve essays, Shinner holds a mirror up to the complex desires, fears, confusions, and mysteries that shape our bodily perceptions. Some of the pieces examine the disposition of the body under emotional or physical duress; others look at it as transgressive, and transgressed. There are 206 bones in the human body, 29 in the skull alone. Ten major organ systems. Toss in the soul, which Descartes said resided in the brain while some of his fellow Frenchmen opted for the liver. What does the whole mess mean?